This series is only about selling toys! Sure, Transformers, GI Joe, and other 80s cartoons were also about selling toys, but at least those shows tried to provide characters that you cared about, characters that had personalities and strengths and weaknesses. The characters in this show show are all so bland! I used to have almost every toy from the first wave, and I even had duplicates of some, and yet when I watched this series on DVD not a single episode seemed familiar, not did the characters. As with most 80s cartoons, there is a group of bad guys and a group of good guys. Here, the bad guys are called V.E.N.O.M. and the good guys are called M.A.S.K. Both groups have vehicles that transform and masks that have special abilities. The leader of the V.E.N.O.M. is Miles Mayhem, who flies around in a helicopter that can transform into a jet. His mask shoots acid pellets or something like that. Matt Tracker is the leader of M.A.S.K. and his vehicle is a Camero called Thunderhawk that transforms into a jet. His mask helps him to track by showing different visual spectrums. Oh, and it also can hover him down slow when he's falling... or something like that. I don't know, it's kinda like they make this stuff up as they need it. Okay, so let me tell you about some of these episodes. In the episode called "The Spectre of Captain Kidd", V.E.N.O.M. tries to steal gold hidden inside old cannonballs by rigging devices to shoot the cannonballs onto the beach so that everyone thinks ghosts are shooting them. Of course this is WAY easier than just walking up and stealing the cannonballs. In "The Creeping Terror", V.E.N.O.M. wants to find a temple lost in the jungle... so of course the use a bunch of giant caterpillars to clear the jungle. In "Vanishing Point", V.E.N.O.M. wants to steal a new prototype jet that can be taken apart and reassembled anywhere... because they have the technology to create helicopters that can transform into jets in mid-flight yet they can't figure how to to make a "portable" jet? And if a jet can fly, doesn't that automatically make it portable? Anyway, so they fool the test pilot into landing at a fake runway that they created (at great expense) which can fold away into the land to hide, and then fooling the real runways radar to make them think the jet is actually landing at the real runway. Before every mission, Matt Tracker asks the computer to select the best people for the mission, even though he never tells the computer what the mission is. A signal is then sent out to all of their special M.A.S.K. watches indicating that need to drop everything and get to M.A.S.K. headquarters immediately! I can understand it in the first few episodes as a way to get to know the characters, but every single episode?! It really gets annoying. Also, Matt has a son named Scott who always ends up coming along on missions... and yet for some reason Matt is always shocked when he notices that Scott is there. After the 50th time is it really necessary to exclaim "Scott, what are you doing here?!" The toys that went with this show were pretty cool for their time, but the show itself is fairly forgettable. I do like the amount of content you get with this set, AND there are extra features, which seems to be pretty rare for a cartoon TV series DVD release. 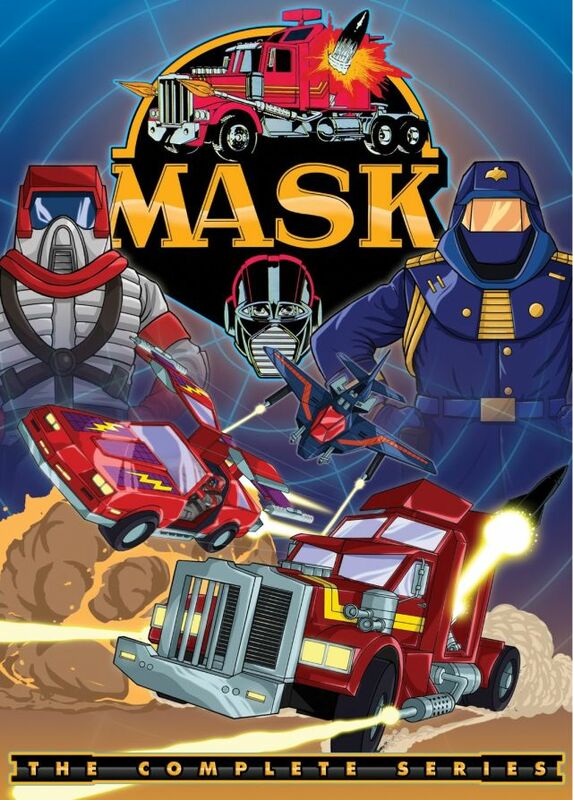 On Disc 6 (Volume 3, Disc 2) there is a featurette called "Unmasking M.A.S.K." which is about 14 minutes long where two of the writers on M.A.S.K. talk about their experience writing and working on the show. On Disc 12 (Volume 6, Disc 2) there is a featurette called "Saturday Morning Krusaders" which is adult M.A.S.K. fans talking about the show for a little over 20 minutes. And it's cool because they love the show but they also make fun of all the stupidity in the show. Watching that extra feature gave me a different appreciation of the show. I think these two extras were actually more interesting than the show itself. ALL 65 ORIGINAL SERIES EPISODES IN A 12-DVD BOX SET FINALLY HITS NORTH AMERICAN HOME ENTERTAINMENT SHELVES FOR THE FIRST TIME!